Printed circuit boards, at first glance, seem like simple rectangles imprinted with intricate copper designs. 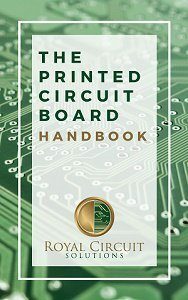 But there are many variables involved with creating PCBs: the soldermask, the silk screen, the copper weight and width. However, the underlying foundation, the laminate, is sometimes glossed over. There are many different types of laminates and selecting the right one is critical. Much as a house of extremely high quality can be destroyed by a shaky foundation, a well-designed circuit can be ruined in either its performance or robustness by an inappropriate laminate. Laminates are made up of layered, and sometimes woven, fabric, fiberglass, or paper that is then adhered into a single unit via a resin. Typically the laminate can only be seen on the edges of a PCB because it is covered by copper, solder masking, and silk-screening. However, close inspection of those edges will show the many different layers that make up the overall laminate. Laminates can be made thinner by using less layers, but the trade-off is decreased board rigidity. This can cause manufacturing and assembling issues and also make the board more susceptible to broken traces due to over-flexing. There are several different variables to consider when deciding what type of laminate is best for your board. Depending on the circumstances, some of these may be more relevant than others. As the engineer, with better knowledge of the circumstances in which the board will be used, you need to decide what is best for your product. The coefficient of thermal expansion (CTE) is a property that describes how much a board will expand or contract depending on the temperature. A low coefficient indicates that the laminate will not expand or contract significantly during temperature changes. Copper has a relatively low CTE, while laminates tend to have higher CTEs. For PCBs, the CTE is more applicable in the vertical direction as the horizontal direction is constrained by the laminate’s latticework. A laminate that expands a great deal with temperature can cause copper traces and vias to break as the copper will not expand nearly as much. For thinner, two or four layer boards, this is not generally a concern. 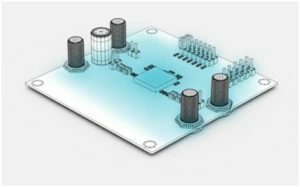 But, when the boards are much thicker and the vias smaller, particularly if the board will be subject to more extreme temperatures, this can be a sizable weakness in the design. Most laminates generally have close CTEs, but a laminate of nearly pure polytetrafluoroethylene (PTFE), more commonly known as Teflon, has a CTE several times greater than other laminate types. For high-layer boards, the use of mostly PTFE laminates is unfeasible. The glass transition temperature (Tg) is the point wherein the laminate changes from the hard, rigid form that most people are familiar with to a more soft and malleable form. While it is not technically melting, it is losing strict adherence to its original shape. With higher processing temperatures due to lead-free processes, the Tg temperature of laminates are closer to the threshold and care must be taken to not overheat and warp them. These same concerns are applicable during the circuit board life, making certain that, even while not being operated, the board never exceeds the rated Tg temperature. In this case, flame-retardant grade 4 (FR4) has one of the lowest Tg temperatures among laminates, though different variants on FR4 have different levels. 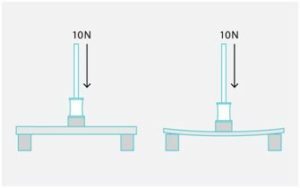 The dielectric constant (Dk) is important because the laminate on which copper sits also has electrical properties that can affect high-frequency signals on the board. A stable and predictable Dk allows for more accurate calculations when it comes to designing the layout. FR4 can vary significantly in these cases and is also highly dependent on temperature. The PTFE-based boards have more predictable Dk, and the change of Dk (TcDk) is much lower than FR4. In essence, if there is a high level of precision required on the Dk of a board, FR4 is typically not going to provide the performance necessary. The thermal conductivity of a board is very important for boards that host large surface-mounted power devices. If the circuit board is going to be acting as a heat sink for a particularly hot integrated circuit, a more thermally conductive laminate will help the copper in pulling the heat away from the IC and spreading it across a larger surface area for better dissipation. Of course, one of the most important variables for nearly every design is cost. FR4 is inexpensive, easy to manufacture, and is produced in large quantities. Other laminates are more expensive to make and more difficult to work with, particularly with vias and plated through holes. This difficulty will be passed on to you in the form of increased cost. However, like all the other variables mentioned, this is simply one item that needs to be balanced against all the other requirements. This list of variables is simply the tip of the iceberg on the different ways a laminate can affect your design. If you want to push the envelope for your circuit and fully utilize all the options available, consider your options before defaulting to the industry standard of FR4. You may find that FR4 fits your purposes perfectly or you may be surprised to find significant performance gains in going with another laminate type. However, you will never know unless you research it and find out for yourself. Printed circuit boards are the foundation of all electronic products. Use our PCB Handbook for advice and insights on designing error-free PCBs for ultra-fast fabrication.